Musannah near Barka is a well-known destination for resort holidays in Oman. The “Batina Area” north of Muscat is popular with many Oman-Travellers because of a broad offer of water sport activities, especially for diving tours to the nearby Damanyat Islands and extensive walks on the beach. The Millennium Resort offers a wide range of facilities to ensure a best holiday (mini golf, tennis, different pool, activities club and many more). It is situated about 75 km north of Muscat International Airport directly at the coastline, the transfer takes about 45-60 minutes. Musannah is a great destination for the relaxed comfort of a holiday resort right on the beach and to enjoy various sports and activities. The open and wide beach stretches out over kilometres in both directions and invites you to extended walks in the sunset. Musannah is a promontory that provides god possibilities for safe and comfortable coaching depending on the prevailing direction of the wind. In winter, the temperatures stay around 25° C in the area. In summer, the temperatures are likely to raise up to 40° C. Most of the time, the water temperature stays over 24° C, even in winter. As the wind is usually not too strong, the area is well dedicated for kiteboarding beginners. 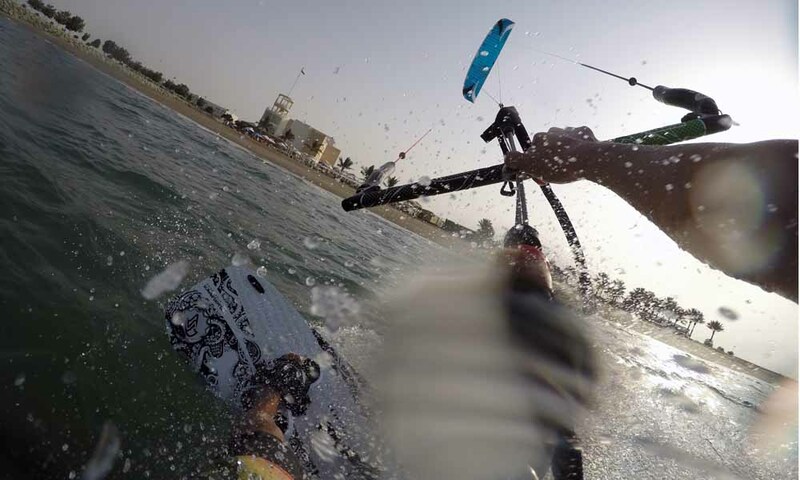 Kiteboarding / Kitesurf on FLysurfer Speed5 and FlydoorL in front of the Millenium Resort Oman. Around Sawadi peninsula, there are different shalow areas which ensure coaching in easy conditions causing a fast learning curve even when there is a change in water levels. The Sawadi Beach Resort is not in operation since a while. Talks are on for a re-opening in mid future. We will keep you posted.